Reading without a direct line of sight: reading via radio frequency, from a distance and contactless through a number of materials such as cartoon, wood, etc. Bulk reading: reading many items at a time. Reading automation: RFID-tagged items within the reader’s read range can be automatically scanned and written. Hence the movements of these items can be continuously scanned by installed readers. Serialized identification: objects can be identified individually through the unique serial number on the RFID-transponders. 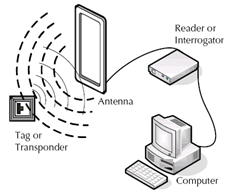 Localization: since the position of fixed readers is known, it is possible – by means of triangulation – to identify the position of an RFID-tagged object. However, it wasn’t until the development of international standards, the miniaturization, and the price decline, that RFID technology became economically feasible for deployment beyond niche applications. RFtrend’s goal is to exploit these advantages for its customers by providing them with cutting-edge soft- and hardware systems.